Positive Detroit: Drum Roll Please.....Win a VIP Date to the Detroit Music Awards! Drum Roll Please.....Win a VIP Date to the Detroit Music Awards! 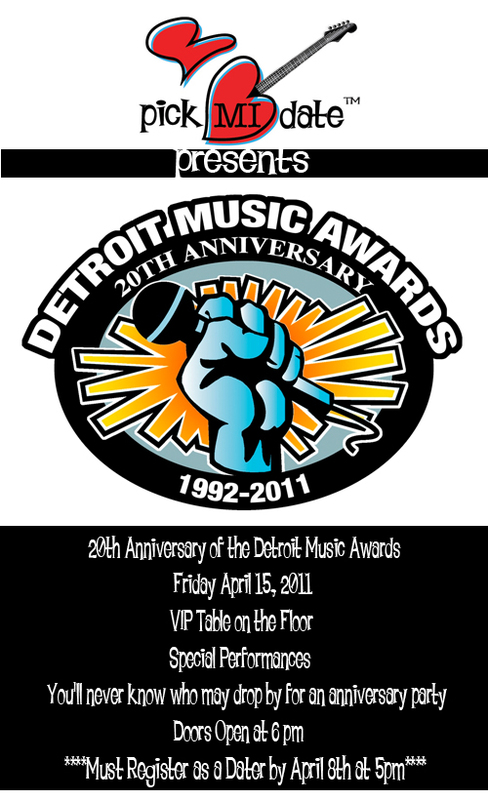 Drum Roll Please.....Pick Mi Date is Sending Their Next Round of Daters to the Detroit Music Awards! This isn't just any Awards Show...it's the 20th Anniversary and will be Amped to 11! They can't let all the secrets out, but can say Mayer Hawthorne (a PMD fave) will be performing! Click HERE to listen to our favorite song! That's not even the Most Exciting Part! The winners will be sitting at a VIP table, surrounded by all the nominees, musicians, and celebrities! Go! Go! Go! Click HERE! Part game show. Part match-making. AND all fun! Pick Mi Date is a whole new way of meeting people. We put eligible singles online and let the public have their say about who should hook up. The winning match ups will be sent on an all-expense paid date to one of Detroit's sweetest establishments. Best of all, the tab is on us!